Yikes. Look at the size of this new 3D printer. It’s so big the guy in the photo is using a cart to unload a printed model from it. It the new Objet1000 and has a massive build volume of 1000mm x 800mm x 500mm. And that’s ten times the build volume of their next largest system, the Objet Connex500. Incredible. A printer of this size makes the possibility of printing large scale 1:1 models much more likely. 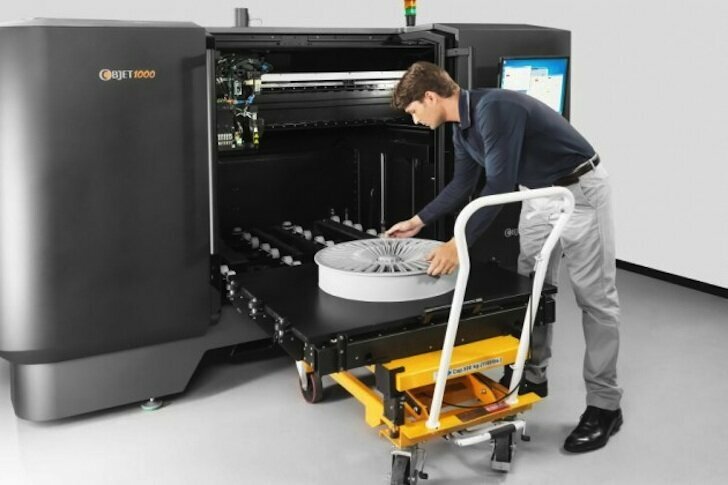 Like other Objet 3D printers, there are more than 100 different materials with which to print, and the Objet1000 can print up to 14 of them in the same model in the same session.